Bart: If you quit, it’d be like an expert knot tier quitting a knot-tying contest right in the middle of tying a knot. Lisa: Why’d you say that? Bart: I dunno, I was just looking at my shoelaces. Back during college, I was replacing a button while chatting with my mom. As I worked on tying the knot at the end of the thread, she started to laugh. “What ARE you doing? !” she asked. 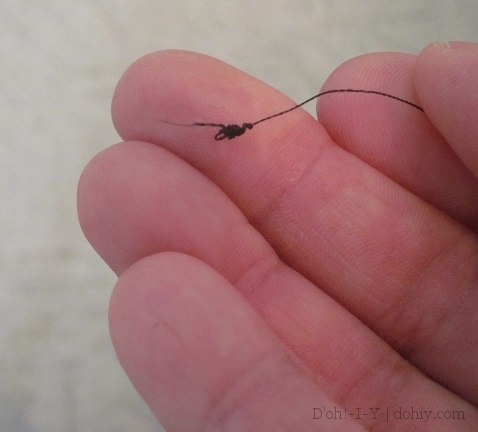 “Tying a knot in this thread,” I replied, sensibly. “You’re certainly doing it the hard way!” she exclaimed. To which I said, “Well, YOU taught me to sew, woman!” But only in my head, because that’s Level Six Sass-Talk, and that’s not allowed in my family until you’re at least 29. 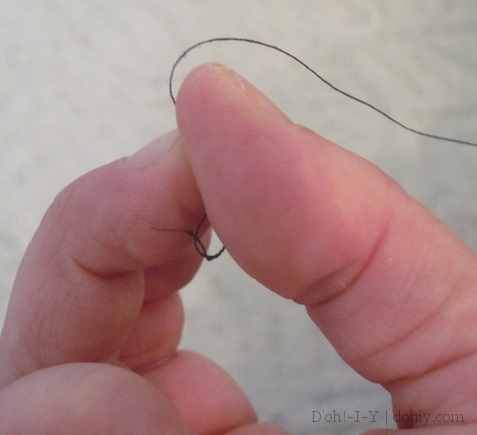 She then taught me the World’s Quickest and Most Effective Knot-Tying Technique for sewing thread. (By the way, this “thread” I speak of is more commonly known as “cotton” in the UK.) Some of y’all may already know it, but it was a revelation to me! Moms know all the good tricks. 1. Moisten your index finger. I just lick my right index finger, but choose your own moistening technique. I have a friend and reader who hates the word “moist” but I’m sorry to say, you can’t moisten without moistness. 2. Wrap the end of the thread around said moist finger so the thread overlaps across the finger pad. 3. 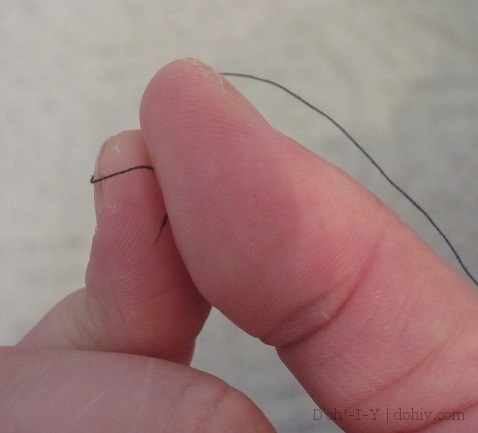 Using your thumb, roll the thread off the end of your finger. 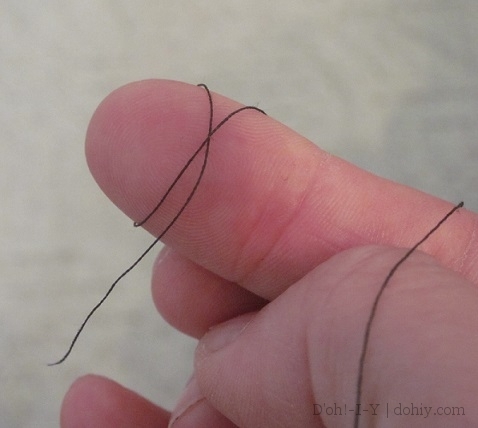 The thread will get tangled up in itself as you roll it. 4. 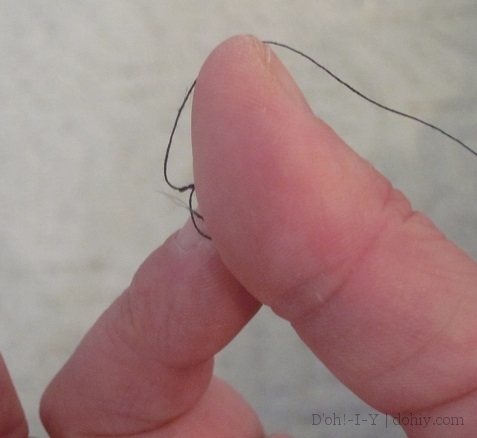 Pull down along the thread with your middle fingernail against your thumb to set the knot. Once you’ve done it the first time, it will take you about a tenth of a second every subsequent time (unless you are trying to do it slowly for video purposes). These pictures show the really deep creases in my palms and fingers. My mother has them as well — a fortune-teller turned her down once as being “too complicated”! My college boyfriend said my creases were because I never did any “real work” to wear them down. Retroactive nertz to him! Got any funky sewing tips? Bad boyfriend stories? I love to learn new tricks (and hear tales of bad boyfriends), so please share them in the comments. This entry was posted in American vs English, D'oh!, Family, Repair & Maintenance and tagged hand sewing, sewing skills, tying knot in cotton, tying knots in thread. Bookmark the permalink.